Anita Gatto is the Chief Growth Officer of her own experiential marketing agency, Self Employed. 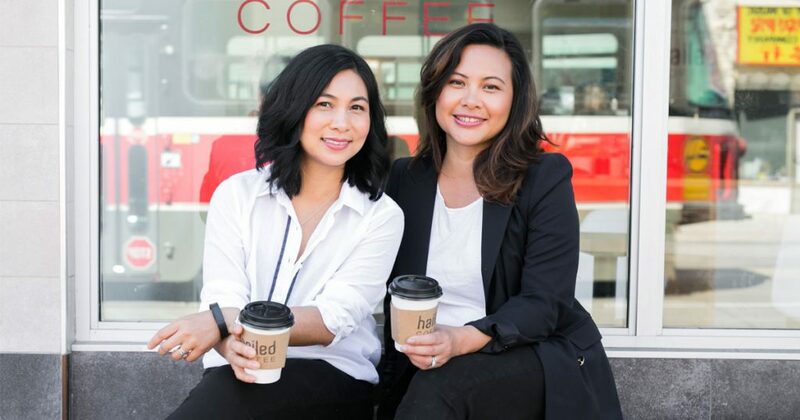 Along with her business partner, Chief Branding Officer and new mom, Sarah Ivory, they’re forging a new way to find start-up success that embraces working motherhood, instead of stifling it like so many of their job environments did before. Anita has an impressive C.V. that includes in-house gigs with Tommy Hilfiger and John Varvatos and clients such as Hulu and PepsiCo. Formerly from Toronto and now based in L.A., her client list buzzes with names like Kylie Jenner, KKW Beauty, Ember, Westfield Group and more, plus her toddler daughter is expecting a new baby sibling this December. Her thriving agency was launched while she was pregnant two years ago and with LoveMom.ca Anita reflects on the unwritten rules that have guided her success so far. Get started on a hunch. “Sarah and I found each other when we were not interested in the PR model anymore. We met, and quickly realized our personalities were a perfect match; essentially, we dated and worked on a project before thinking of starting a business together. We strategized and asked each other critical questions of how we approach business. I was pregnant at the time, but that never came up. Instead we asked: How are we going to be our most creative selves? We both knew the type of traditional PR we were both used to didn’t make sense anymore, especially for the retainers agencies were charging. Strategy was missing—beyond crisis PR and maintaining a calendar. And we instinctively knew journalists are the best storytellers and it was our job to give them a story they would really want to report. We wanted to break those barriers down and start something that was authentic and transparent while keeping a low overhead and putting budget where it should be — the work being activated. So we created an experiential agency. As Sarah puts it, we provide the human experience of an advertising campaign while creating memories for the target audience and media to remember about that brand. Be creative first. Brand yourself later. Bring your feelings to work. Baby is good for business. Anita is cultivating a Zen attitude about parenting with plenty of help from The Awakened Family by Dr. Shefali Tsabary. Oprah-approved, this read combines Eastern philosophy and Western psychology to help parents nurture confident and conscious children into their best selves. One of the perks of Anita’s circle of trust is that it includes international photographer Rankin, who took this shot of little Mia with his signature point of view. Her favourite piece of jewellery: Her engagement ring. This Cartier stunner is not only brilliant, but less apt to get caught in her wee one’s clothing and hair. This mom loves the tongue-in-cheek attitude of the Jonathan Adler’s Kiki’s Derriere Vase that was made in homage to Kiki de Montparnasse, the legendary nightclub singer, actress, painter, and French artists’ muse. Motherhood doesn’t mean saying sayonara to cut-offs. When she’s off-duty and sprinting after her littles, Anita reaches for her vintage Levi’s shorts.